These are white or tooth coloured fillings which are made of a plastic material mixed with small glass particles and can be used on all teeth. Severely broken, cracked or decayed teeth may be unrestorable or may have a very poor long term outcome. Teeth with severe periodontal disease. Severely infected teeth that are unsuitable for root canal treatment. To create room for other teeth prior to getting braces. In the majority of case, it is best to attempt to save your natural teeth, however in some cases extraction becomes one of the very few remaining treatment options. Neural x-ray only look at one or 2 teeth at the time and don't always allow for early detection of problems. When a tooth is removed, the other teeth tend to shift and become over-stressed and this can impact greatly on your dental health. To avoid further complications, dentists will often recommend replacing any extracted teeth, and although extraction may be the cheapest treatment option available, replacing teeth can easily cost far more than the option of saving and rebuilding a tooth. All teeth have a central part known as the 'pulp'. This is the 'living' part of the tooth, which contains the nerves and blood vessels that keep the tooth alive. Tooth infection - An untreated cavity or a very deep filling can cause bacteria to infect the pulp. This infection may spread to the bone surrounding the tooth and cause an abscess or if left untreated, can spread to other parts of the body and cause very serious medical complications. Tooth trauma - This can damage the pulp, which may not be able to heal. 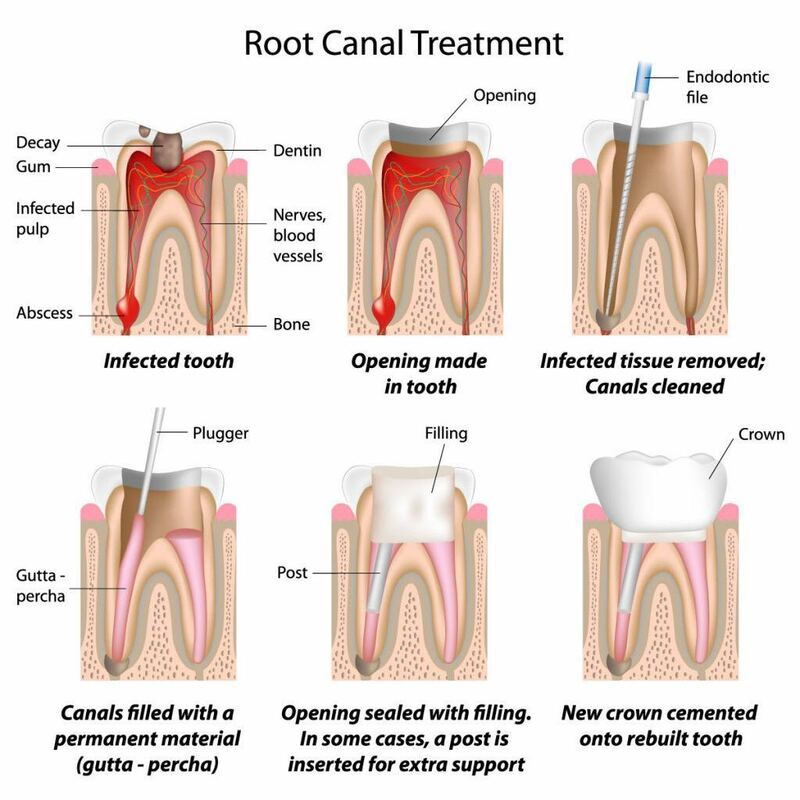 The aim of root canal treatment is to remove the infected or damaged pulp in order to save the tooth. A root canal procedure involves removing all infection and pulp tissue from the tooth's canals using special thin instruments, cleansing and shaping these canals, then filling them with materials made specifically for preventing pain and infection from recurring. Root canal treatments can take one or several visits to complete and depend on the severity of the problem or infection. After the procedure, the majority of teeth which have had a root canal treatment will require a crown or protective restoration in order to prevent fracture of the tooth or re-infection from occurring. If root canal treatment is not carried out, an infected tooth may require an extraction. It is important to consider saving teeth rather than extraction due to the many other dental issues that can develop from missing teeth.